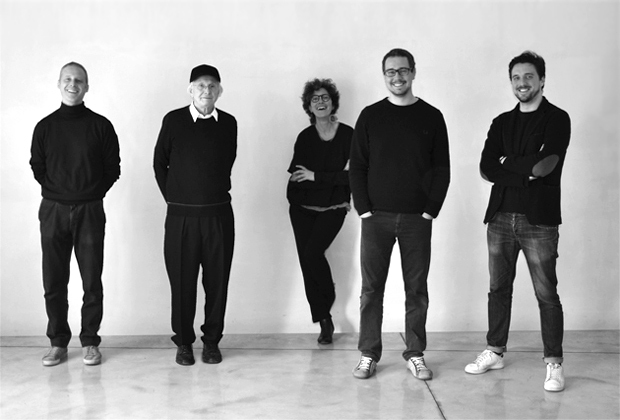 Born in Feltre in 1939, Luciano Bertoncini moved to Treviso and started working at the architect Vittorio Rossi‘s Studio gaining experience in building and design brands. In this period he designed the bed Zattera and the living rooms furniture Italian Look which contributed to define the Italian modern furniture. He met the designer Joe Colombo, art director at Elco, who included in his catalogue the coat-stand Gronda (winner of the 2nd prize at the Abet Print contest in 1971). After the unexpected Joe Colombo’s death, he realized the executive phase of his project for the exhibition “Italy : the new domestic landscape” at the Moma in New York. With his Office in Treviso, he engages in design and architecture. His collaboration with Aprilia brought out the project of the motorcycle Tuareg Wind, selected for the XIV° Compasso d’Oro contest. In the furniture branch, he collaborates with several companies and, with Bellato, his bed Onda has been selected for the X° Compasso d’Oro. He looks after the company image of Technogym, Seventy, Aprilia, Diadora, Invicta and Belstaff, projecting also their Mono Brand shops. In 1999, the city of Oderzo dedicated him a personal exhibition for his 30 years long activity, with a publication edited by Virginio Briatore, presented by Sergio Polano, RDE Ricerche Design Editrice.